I am obsessed with being obsessed. I say that because yesterday I stated I was obsessed with Walking Dead and with all these ‘ghoulish grub’ recipes. Lol! I just love all the suspense and fun that comes with time of year! That’s not a bad obsession, right? Well, when I was thinking of Halloween recipes to share with you all this week, I had several different ideas for different beverages. But when I went to create them nothing was working out as I hoped. 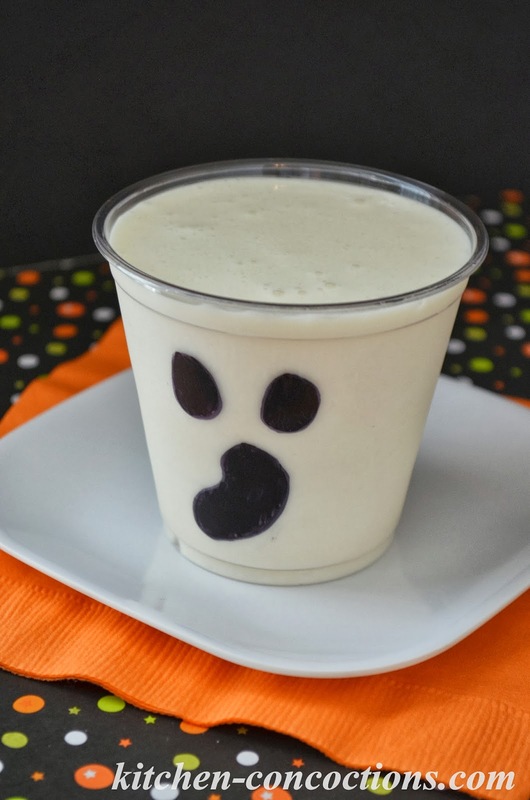 I then remembered this Jack-o-Lantern Smoothie I made last year and this Frosty the Snowman Smoothie I did for Christmas a few years ago. So I started thinking of more ideas like that. I then realized I have become obsessed with making these cute beverage creations. These fun and festive smoothie drinks are so easy to make and are so versatile. 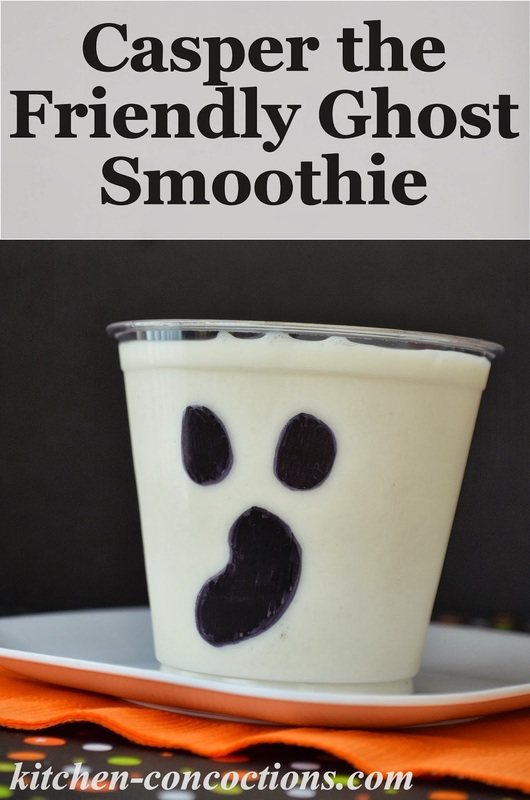 I chose to make this ‘ghost smoothie’ a simple Very Vanilla Smoothie, but you could fill your ghost cup with any white drink you wish. From just milk to this Banana Oatmeal Smoothie, to a vanilla milk shake or even a White Russian for an adult drink. I always try and throw in savory or somewhat healthy recipe (aka not super sugary) when I do ghoulish grub week. This smoothie fits the bill and totally tastes like a milkshake but it is healthy. The other good thing about this Halloween recipe is that it doesn’t require any special ingredients or supplies (everything you probably already have on hand), which is great, since so many of these fun holiday treats require purchasing lots of ‘extra’ ingredients. By the way, I don’t think I’ll be able to stop here… let’s see how many of these character drinks I can come up with! Oh… and my ghost doesn’t look too ‘friendly,’ more like spooky…. oh well! Combine all ingredients in a blender and process until smooth. Add additional milk, if needed, to reach desired consistency. 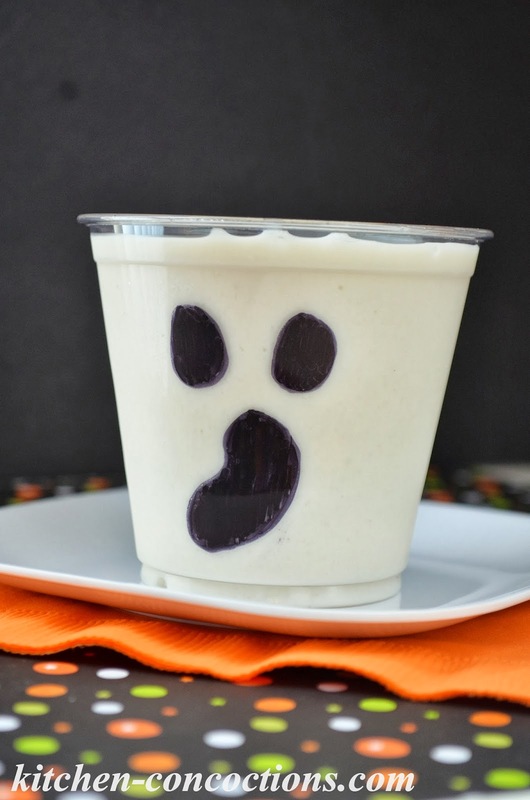 Draw ghost face on plastic cup using marker. Pour prepared smoothie into cup. Serve immediately.